Richard Haines was the progenitor of the Haines family of Burlington County, New Jersey. Very little is known about him or his life in England. The first record of him is found in Parish Records of St. Michael's Church, Aynhoe, Northamptonshire, when his son Richard was baptized on August 6, 1665. Sometime previous to this date he had married his wife Margaret, and they had had at least one other child, John. These events probably did not take place in Aynhoe, as no record of them can be found in the Parish Records. It seems likely that Richard and Margaret located in Aynhoe shortly before the baptism of their son Richard, and before then had lived in one of the neighboring parishes. However, they continued to live in Aynhoe until leaving for America, as is evidenced by the baptism of two of their sons in 1666 and 1672; by the record of the birth of their daughter Mary in 1676, Banbury MM, Oxfordshire, when his residence was given as Aynhoe; and by the deed dated April 21, 1682, in which his residence was given as Aynhoe. 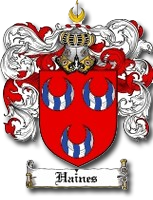 It is not known what variation of the Haynes-Haines name Richard used in England. The records of St. Michael's church show his name as Hains and Haynes. The records of Banbury MM show his name as Haynes. The deed record shows his name as Haines. Some of the early records in America show the name as Haynes. But these variations in spelling may be due to the persons actually writing the records and might not reflect the spelling of the name as used by Richard. It is significant, though, that all known descendants of Richard have used the spelling Haines, and continue to do so until this day. Richard and Margaret Haines became members of the Society of Friends sometime during the period 1672-1676. It seems likely that this religious association had some bearing on the decision of Richard Haines, and of John Borton, his fellow townsman, to emigrate from England to America, and undoubtedly it was a contributory factor in deciding where to settle in America. Richard and Margaret Haines, with their children Richard, Thomas, William and Mary, left Aynhoe of ye Hill in the spring of 1682. They embarked at Gravesend, England, on the 'Amity' — Richard Diamond, Master — and sailed from Downs, England, for West Jersey, on April 23, 1682. The trip was long and tedious, as was common in the days of sailing ships. Richard, the father, sickened and died. After his death, another son, Joseph, was born on the high seas. John Haines, oldest son of Richard and Margaret Haines, preceded his parents to America. He accompanied John Borton and family, also of Aynhoe, to America in 1679, and was undoubtedly instrumental in deciding his parents to leave England for America. Margaret Haines and her family arrived in Burlington, N. J., in the fall of 1682. There is no written record of the hardships encountered by this recently widowed woman with a large family in a strange country. In about two and one-half years, on 3 mo. (May) 6, 1685, at Thomas Gardiner's house, Burlington, under the care of Burlington MM, N. J., she married Henry Burcham, of Neshamony, Bucks Co., Pa.
RICHARD HAINES and his descendants. A Quaker Family of Burlington County, New Jersey since 1682. The pages also mention John Borton, also our ancestor. Mary Haines - 1767 - ?